Traditional server architectures have tied high amounts of PCIe connectivity and memory capacity to dual socket designs. The AMD EPYC platform frees server designers from this limitation, allowing us to design single-socket servers with features only seen before in dual socket platforms. The Tyan Transport SX (TN70A-B8026) allows datacenter architects to select the right sized CPU without sacrificing memory capacity, memory performance, or PCIe connectivity. The platform is a 2U server barebones based on the outstanding Tomcat SX (s8026) single-socket AMD EPYC motherboard. The B8026T70AV16E8HR model is a hybrid storage server with support for (8) 2.5" NVMe and (16) 2.5" SATA drive bays. The server supports up to 6 PCIe slots in the back, with a pair of x24 riser cards that can both support either x16/x0/x8 or x8/x8/x8 configurations. An OCP v2.0 LAN Mezzanine provides high speed network capability, with support for either x8 or x16 network cards and speeds up to 100Gigabit Ethernet. A x16 LAN Mezzanine borrows 8 PCIe lanes from a riser slot through a MUX. 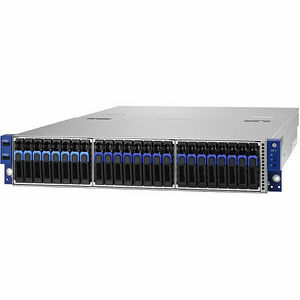 The TN70A-B8026 is a versatile design and has an alternative all-NVMe model named the B8026T70AE24HR with support for 24 NVMe Hot-Swap 2.5" bays. More details about the B8026T70AE24HR can be found here.